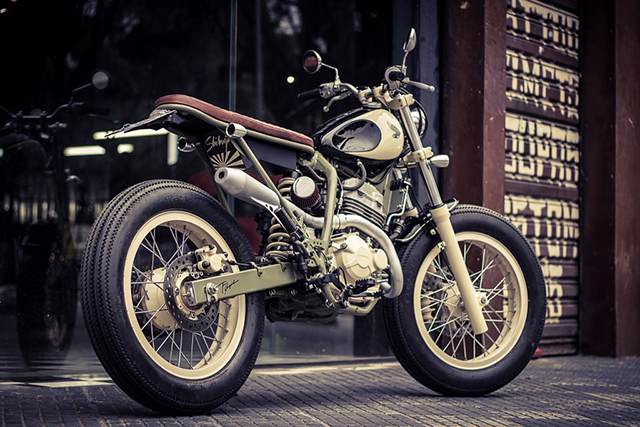 The Honda XRE300 is a dual sport bike manufactured for the South American market. Honda called it “aggressive looking” but in reality it is one fugly machine – with a pointy plastic nose that looks like a large bird beak. 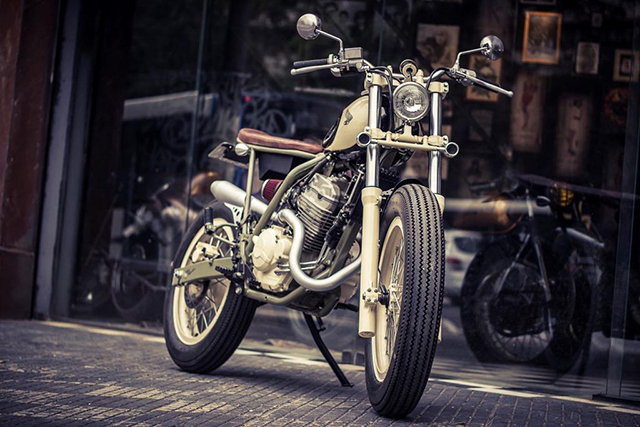 The XRE was the donor given to the team at Shibuya Garage in São Paolo to create a stripped back, brat style bike. Owner and designer of Shibuya, Teydi Deguchi, took the brief and got to work transforming this ugly duckling. 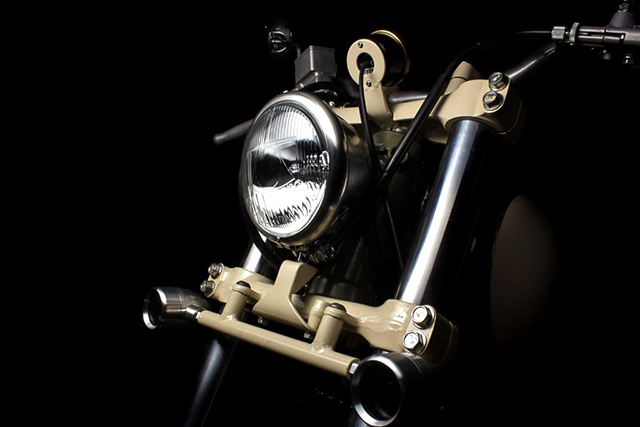 The goal was to build a bike with a lightweight aesthetic and pure brat style look, which would be perfect for cruising the busy streets on those warm Brazilian nights. The bike’s factory rims are gone, the XRE now sports the brat obligatory Firestones, wrapped around DID rims. The inspiration for the rolling stock being from Teydi’s idea that the bike should be influenced by the Japanese underground. 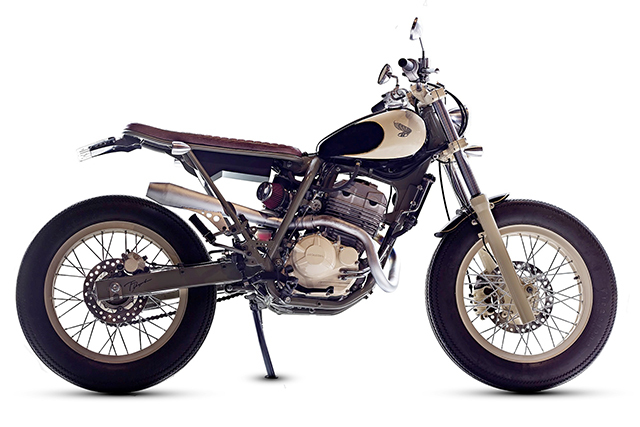 The front fender has been swapped out in the pursuit of minimalism, and the front forks filled with Brembo fluid. Ride height has been modified to that of brat style, and to allow for the change in rim size from the factory setup. It was decided during the build to fit a Motogadget, the Shibuya crew having to suss out how to hook up the German instrument setup to the Honda. This was achieved, with the bike retaining it’s original sensor pick up, as well as the factory Nissin brakes. The incredibly pointy factory fitted guard and headlight have been ditched, in it’s place a 5 3/4 headlight along with some unique turn signals. The lines of the bike have been modified during the build as well. 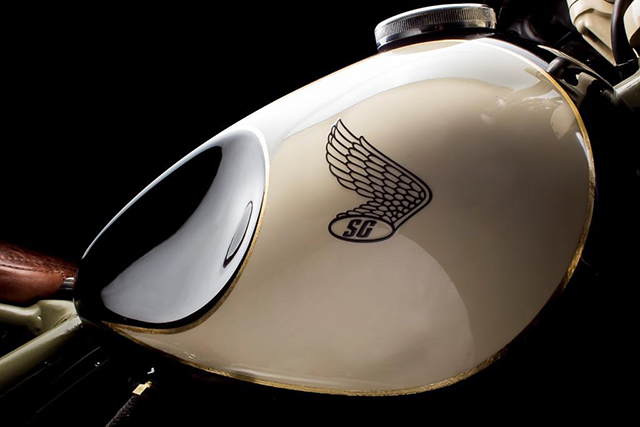 The fuel tank is a custom unit created for this build, finished in cream scalloping with gold leaf pinstriping. 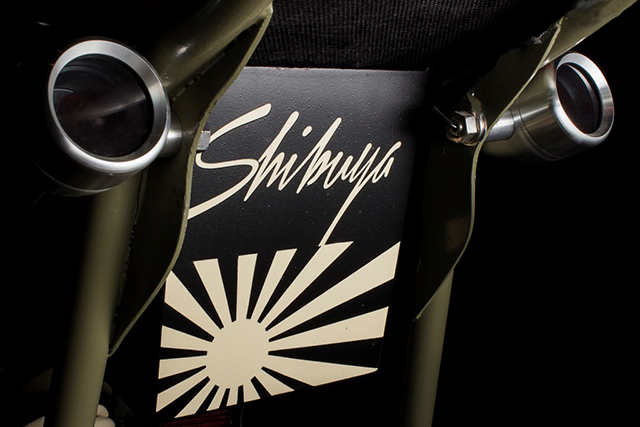 The whole back end of the frame has been changed to suit the aesthetic of the build, with Shibuya creating the neat look by containing all the wiring and control units in a specially made box mounted under the seat. 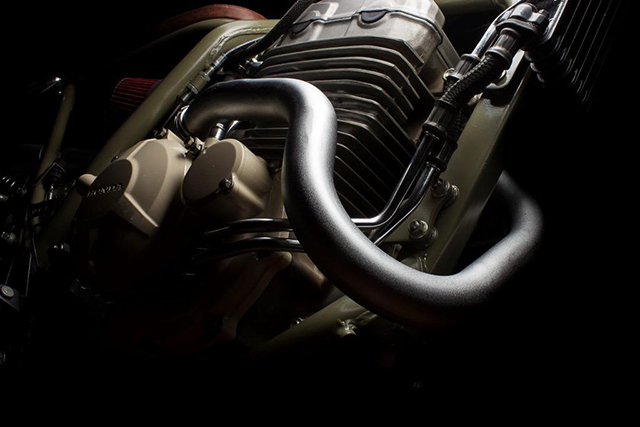 The exhaust system is a work of art in itself. 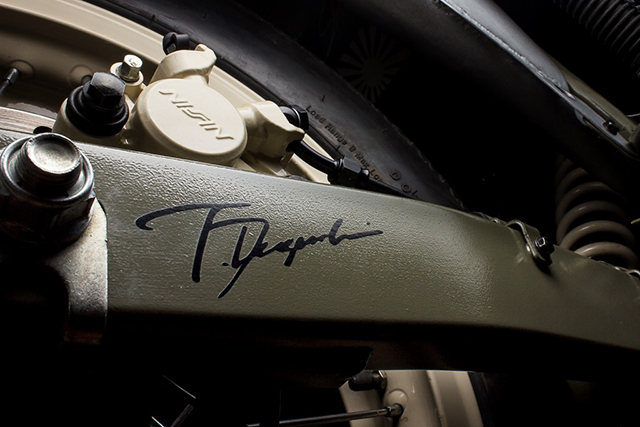 The original engine hugging exhaust styling has been kept, with the piping running through inside of the frame. 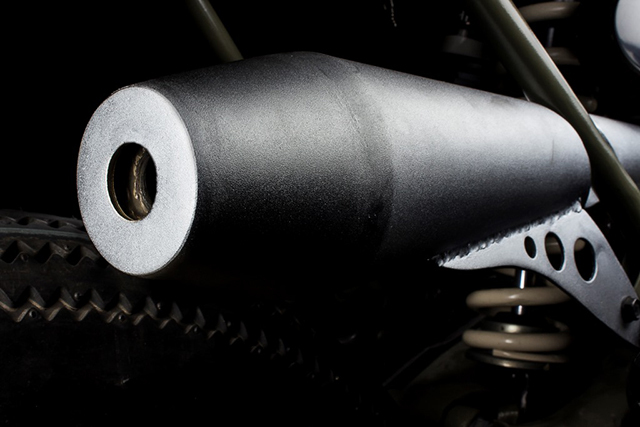 Totally handmade by Shibuya, the system now features a Dunstall style silencer, incorporating bracketry to mount it up to the frame. The piping is finished in matte chrome, a touch used often in the 70s on cafe racers, but not seen as often today. With an excellent build team headed by a leader who knows his stuff, this bike has been changed from ‘dual sport’ to ‘brat sport’. Keeping the reliability of the bike it was built from, but building brat style into the machine, has given it’s new owner a reason to be proud. It’s safe to say, there’s not many XRE’s roaming the streets of Brazil that look like this.